While viewing this fantastic video on evolution and creationism over on Exploring Our Matrix, I caught this. 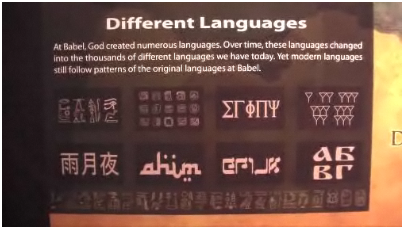 Check out the “Hebrew” (bottom row, 2nd from right). For those of you who don’t know Hebrew, no worries, because that isn’t actually Hebrew. Reminds me of the great movie, Stigmata, what with all their language problems (the writing on the wall that wasn’t the language they said it was).